GnomeBaker is a simple CD/DVD burning application for the Gnome desktop. 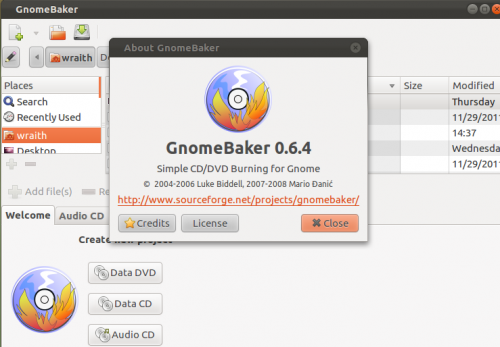 For all those that hate brasero and badly burned cd/dvd media, GnomeBacker is an alternative. Ubuntu 11.10 Oneiric has dropped GnomeBaker since it was available in Natty’s universe repository. No user responded in " GnomeBaker Simple CD/DVD Burner For Gnome Got A Stable PPA "